12 Things You Should Never Say At Work #infographic ~ Visualistan '+g+"
This will only take a minute, so pay attention. 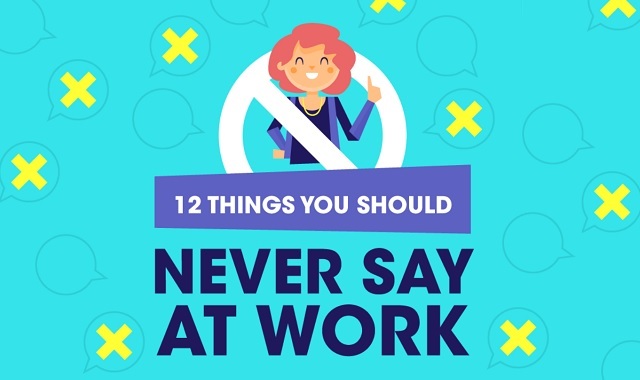 A new infographic about work from Headway Capital lists 12 common statements that you should never say at the office. And if you say these phrases a lot, you may be affecting the way colleagues perceive you. The trouble with workplace conversation is that we just assume that other people understand the nuances of what we mean. If they take offense at our blunt comments, there’s nothing we can do. We did our best, and we don’t have time to think carefully before we speak, so it’s not our problem. We’ve always done it that way. So next time trouble arises at work, think before you speak — it could be the beginning of a beautiful opportunity!